NOTES: From Main Collection. The variations in pre war track are fascinating. Whilst assisting with the research for the Hornby-Dublo book, I started collecting together examples of the various different types and mounted them on the board you see below. 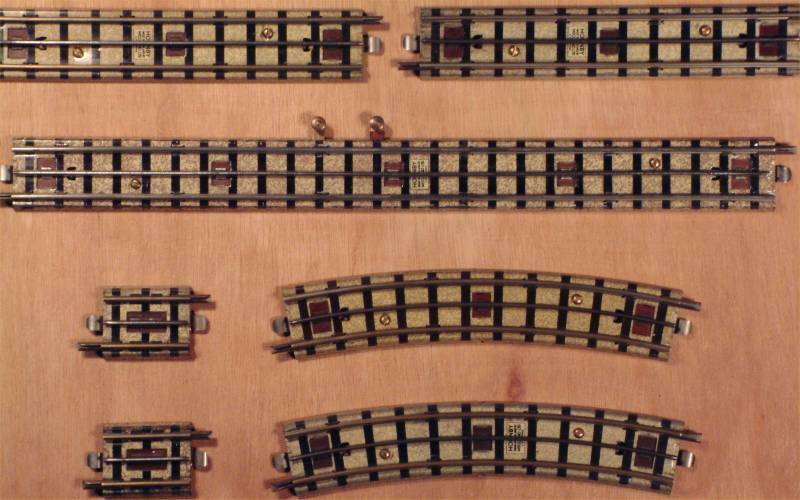 Basically the first issue of clockwork and electric track had brass running rails and connecting tabs and the track contained the square printed Hornby logo. In 1939/40 the track had plated running rails and there are a number of variations. Points had the moving part up to the frog all in one piece, whereas post-war track has a moving and a fixed section. Early points had very weak, cast frogs. These prove brittle, and easily broke also the metal contained impurities. They had sleepers. Later issues of the electric points (very rare) had grey bases and no sleepers as did the electric operated points. Later points had solid frogs and these frogs were used to repair damaged points. Electric rails had steel centre rails. 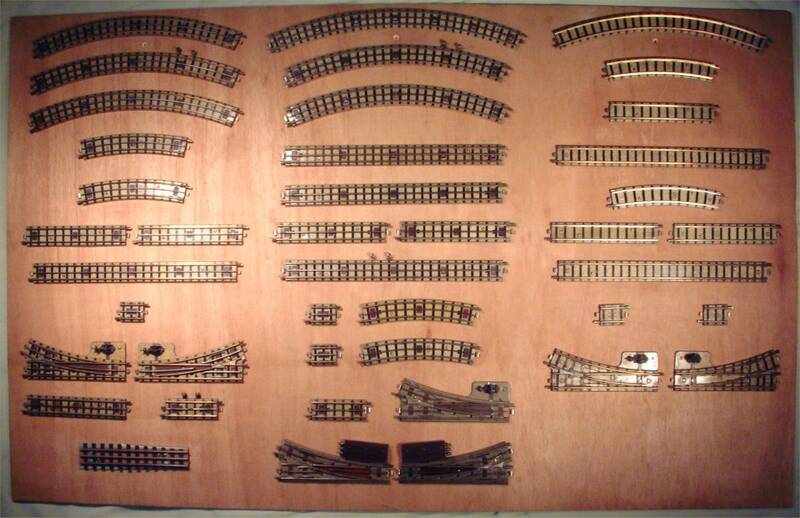 The board contains a single example of a track base with the Hornby logo and a plated centre rail. Whether this was issued pre war is unknown. There are a large number of colour variations in the track base. 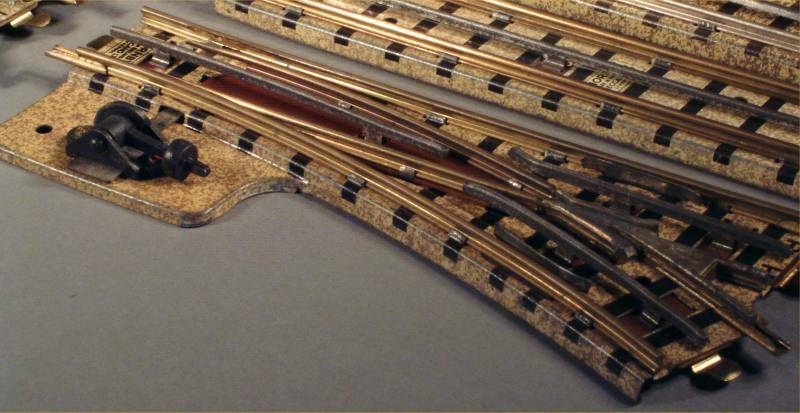 The quarter rails exist both in brass form and plated form. The quarter straights including the isolating rails are, in my experience, were only issued in plated form. The nuts on the isolating rails are normally brass and come with completely flat tops and very slight domes (the domes on post war examples are more rounded. 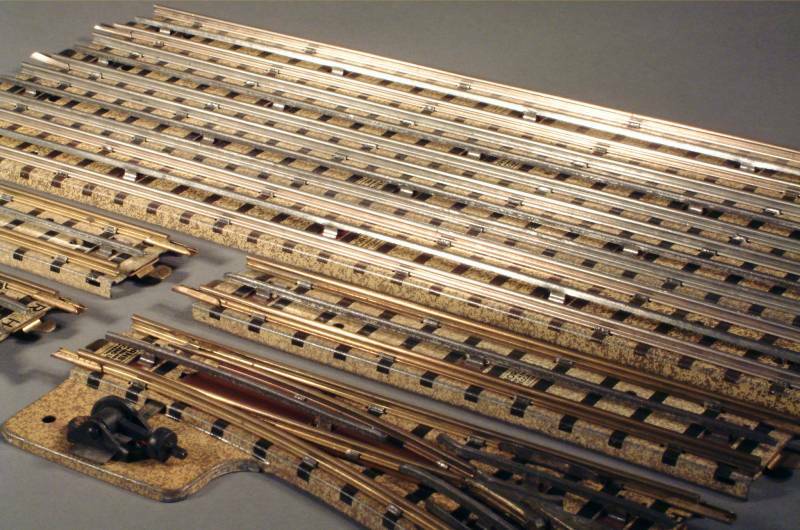 There is an unusual issue of the half electric straight with plated rails and a gold logo. The large radius electric curves have steel centre rail and no square Hornby logo. A variety of different insulating materials were used, some have a matted texture and others are plain. They occur mixed together on the same rail. They were also used for some of the later large radius curves which quite often had the plain insulators at each end and matted ones in the middle. Occasionally rails occur without the square logo. The board has one example of the clockwork half straight and an electric half curve. Additional to the board are two lovely right-hand electric points, two early half straights and four plated full straights as photographed. Pre War Electrically Operated Point (Left-Hand) with solid frog. Electric points come with and without gold labels, the plate under the motor is plain brass, the casting has sharp edges, the centre rails are steel and and the wire has the old waxed coating. This point also has a gold label. 2 EDPR & EDPL Electric Points Boxes (D511). Codes: MW-11603 7,500 440 and BW2093 12.5M 10-38. Please click here for the general condition statement. Please click on the thumbnails to enlarge the picture. These will open in a new page. Close that page to return to this page.